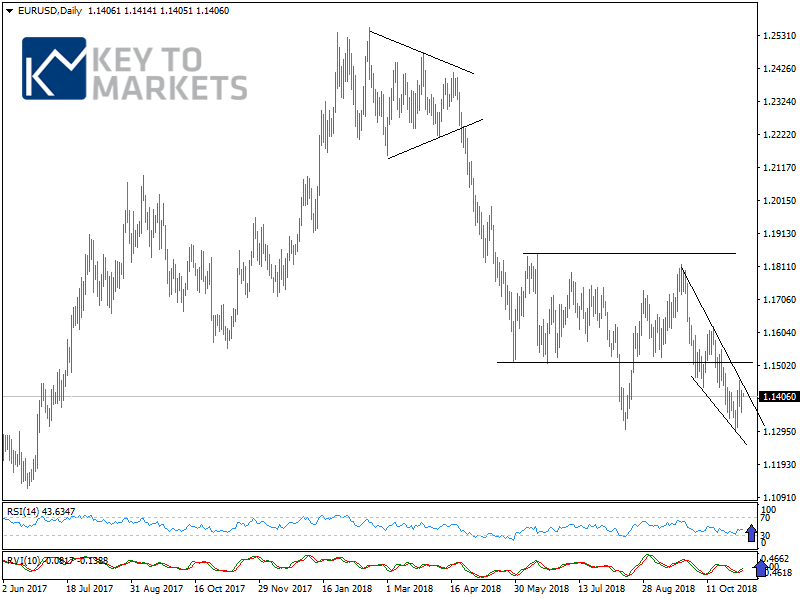 Midterm US election and the recent drop in oil prices are the factors keeping the EURUSD in a narrow range between 1.1800-1.1300 levels. Whereas renewed Italy fiscal concerns have failed to press the EURUSD below the critical support level 1.1300. GDP rose by 0.2% in the euro area (EA19) and by 0.3% in the EU28 during the third quarter of 2018, compared with the previous quarter, according to a preliminary flash estimate published by Eurostat. EA annual inflation is expected to be 2.2% in October 2018, up from 2.1% in September 2018, according to a flash estimate from Eurostat. IHS Markit Eurozone Manufacturing PMI declined to a level of 52.0 in October. From 53.2 in September. We see EZ final Services PMI (Tue) and EU Economic forecast (Thu), not a market mover though. Turning to the US, all eye on the US, midterm election and November FOMC meeting. We are more focus on the US midterm election than FOMC meeting. “We expect a divided US Congress, which means that Trump would be unable to push his domestic policy agenda through. Therefore, in our view, the mid-term elections should have limited implications for markets and the economy, as there will be no changes to economic policy.” Danske Bank said in a note to clients. The technical landscape has not changed since mid- August. We still believe 1.1300 is the critical level to focus ahead of the US data and event risk. EURUSD should lead to the downside with a move below 1.1300 (weekly closing) to its last leg towards 1.1200/1.1170 and 1.1100. Whereas, the risk surrounding the 200MA(weekly) can still be gauged as neutral. The flip side, resistances located at 1.1425 and 1.1460. A move above the last hurdle would point to a new acceleration of the uptrend towards 1.1500 and 1.1550 initially. The daily indicators are still very upbeat on top of it the price action traced out a double bottom at 1.1300.